How we feel about things can be revealed by our stomach. There’s an intimate connection between our brain and our stomach – commonly referred to as the brain-gut connection – that’s hard at work 24/7. As research now shows, those butterflies are like pin pricks of dread for the tummy, turning you into a physical and mental ball of nerves. The stomach is like a control center for mood and other brain functions. A troubled intestine can send signals to the brain, just as a troubled brain can send signals to the gut. Therefore, a person’s stomach or intestinal distress can be the cause or the product of anxiety, stress, or depression. The brain and the gastrointestinal (GI) system are intimately connected, so much so they should be viewed as one system. So when you look at how to improve digestion naturally, you’re also benefiting the health of your grey matter. Researchers at the University of California in Los Angeles revealed some of the first evidence that bacteria ingested in food can affect brain function in humans. In other words, eating the right food can help your mental outlook, changing how your brain responds to the environment. Stressed out? Eat yogurt, for starters. In their study of healthy women, the researchers found that women who regularly consumed beneficial bacteria known as probiotics through yogurt (one serving, twice a day) showed altered brain function, both while in a resting state and in response to an emotion-recognition task. Functional magnetic resonance imaging (fMRI) scans conducted both before and after the four-week study period looked at the women’s brains in a state of rest and in response to a task, where they viewed a series of images of people with angry or frightened faces and matched them to other faces showing the same emotions. This task, designed to measure the engagement of affective and cognitive brain regions in response to a visual stimulus, was chosen because previous research in animals had linked changes in gut flora to changes in affective behaviors. 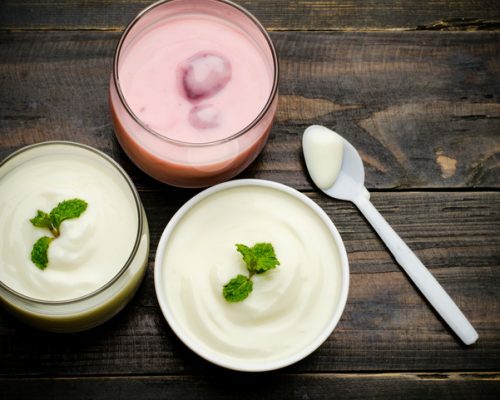 The researchers found that, compared with the women who didn’t consume the probiotic yogurt, those who did showed a decrease in activity in certain areas of the brain linked to emotion and behavior. They remained calm and “in control” throughout. There are studies showing that what we eat can alter the composition and products of the gut flora. In particular, research shows that people with high-vegetable, fiber-based diets have a different composition of their microbiota, or gut environment, than people who eat the more typical Western diet that is high in fat and carbohydrates. Now we know that this not only affects the metabolism but also brain function. Anxiety, where feelings of fear and distress interfere with normal daily functioning. Depression, where feelings of gloom and sadness can also be accompanied by a slowing down of the body and profound fatigue. Autism, a neurodevelopmental disorder, present from early childhood, characterized by difficulty in communicating and forming relationships with other people and in using language and abstract concepts. The research suggests that these brain disorders may be treated through the gut, which is a much easier target for drug delivery than the brain. How is it possible? The gut microbiome communicates with the brain through molecules that are produced by gut bacteria and then enter the bloodstream. These molecules are strong enough to change the behavior of mice, as studies at the California Institute of Technology have shown. Researchers here have found that a metabolite produced by gut bacteria is sufficient to cause behavioral abnormalities associated with autism and with anxiety when it is injected into otherwise healthy mice. There is still a lot more work to be done to understand the gut brain connection, but this is a starting point for new therapies to treat mental disorders. Do your stomach and your brain a favor and take these steps to improve digestion naturally at home. We’ve talked about research on the benefits of yogurt (start with a cup a day, plain with your own added toppings to control the ingredients). 1. Peppermint tea: Take a pass on after-dinner coffee and try a cup of peppermint tea. It does wonders to improve digestion naturally. Buy it fresh for a DIY brew, and steep a few leaves of the fragrant herb for about five minutes. Not a tea person? Try chewing peppermint gum (a natural sugarless brand from the health food section) or sniffing peppermint oil – both good options to help relieve your symptoms. 2. Chamomile: Chamomile tea soothes the stomach and calms the nerves. If, in addition to a stomach ache, you are having trouble sleeping, homemade chamomile tea will soothe you and your stomach. 3. Burnt toast: Charcoal helps neutralize the toxins in the system. If you’ve just had too much alcohol, the charcoal in the burnt toast may help absorb some of the alcohol and neutralize the toxin. Black tea or anything with tannins (not wine) also helps neutralize toxins and process the alcohol in your system. Toast is also part of the well-known acronym B.R.A.T. (Bananas, Rice, Applesauce, Toast), commonly used to treat children with stomach aches or diarrhea. 4. Apple cider vinegar: Your mother probably used this acidic pantry staple for cleaning purposes – a vinegar and water solution is great for streak-free windows and shower doors – but apple cider vinegar has long been used as a home remedy for upset stomach. Studies have also linked it to good blood glucose control, making it particularly helpful for people with diabetes. It’s also been associated with blood pressure control and weight management. Lots of good reasons to give it a try! To improve your digestive health though, a small amount of apple cider vinegar, taken just prior to a meal, can help stimulate the production of digestive juices. You need those juices to break down your food properly so nutrients can be absorbed and used by your body. Mix one tablespoon with a cup of warm water (or cold, if you prefer) and add a little honey to sweeten the drink. Make sure you’re using apple cider vinegar, not malt or white vinegar that you put on your fish and chips. Apple cider vinegar is made from cider or crushed apples, giving it a yellow-brownish color. Unlike the clear stuff, apple cider vinegar contains nutrients and bacteria that make up the cobwebbed, cloudy sediment at the bottom of the bottle. That’s the good stuff! It’s the enzymes that are produced during the fermentation process that make apple cider vinegar so good at tackling digestive symptoms. 5. Ginger: In addition to its anti-inflammatory and bad breath-reducing properties, ginger aids in digestion and can ease stomach pains. Fresh ginger is the best form of ginger, and we recommend making a simple tea with it. Avoid drinking ginger ale, however, since it is loaded with sugar, and most ginger sodas use artificial flavors (no actual ginger). Grate some fresh ginger into your soup or brew it for a soothing tea. Ginger root has a long history in traditional medicine as a natural remedy for stomach upset, among numerous other ailments. To naturally improve your digestive health, some contend it works by speeding up the pace at which food moves into the small intestine from the stomach. When your digestion is motoring along, irritants don’t sit in your stomach and cause you distress. A University of Miami study concluded that ginger extract could be a substitute to nonsteroidal anti-inflammatory drugs (NSAIDS) for pain. The study compared the effects of a concentrated ginger extract to a placebo in patients with osteoarthritis of the knee. The ginger reduced pain and stiffness in knee joints by 40 percent over the placebo. Why the relief? Researchers say that the herb has anti-inflammatory, anti-ulcer, and antioxidant properties, so it offers quite the therapeutic package. If your stomach lining is inflamed or irritated, ginger could provide natural relief. 6. Hot water bottle: Don’t underestimate the healing power of heat therapy. Your hot water bottle or heating pad, placed right on your stomach for a good 10 minutes, is such a simple home remedy for stomach turbulence. The heat increases blood flow to the skin surface, so it moves your perception of pain from inside your stomach to the outside. It’s like playing a mind-game with your brain’s control center, temporarily blocking chemical messengers that cause pain to be recognized by the brain. The heat from your hot water bottle doesn’t just provide comfort (and a kind of placebo effect). Much like pharmaceutical painkillers, the heat from the hot water bottle or heating pad deactivates the pain at a deep, molecular level, giving you much-needed relief. 7. Yoga: Improve your digestion with just 15 minutes of yoga. Start from a reclining position and work to some standing poses. Certain positions like the bridge pose are stretch moves that stimulate your abdominal organs. Follow these with twist poses that massage and tone your abdomen, which are great therapy for gas, bloating, and constipation. Other poses work out your back, neck, and spine – all help the nervous system relax and, in turn, ease your digestion. Digestion troubles can be easily fixed with home remedies, so you won’t need over-the-counter pills or seltzers. Try these tips on how to improve digestion naturally at home – your gut deserves some care and attention – and your mental wellbeing will benefit as well.